I could see the desperation in his eyes. He walked up to me so suddenly that at first I didn't notice him or the small bundle he was holding. He kept repeating the same three words uncontrollably, clearly pleading with me to do something, but I couldn't understand him. And then I took a closer look at the bundle. There swaddled in his arms was a tiny, baby girl; she couldn't have been more than a few months old. I learned that his wife had been killed recently, and he was trying to keep his newborn daughter alive amid the squalid conditions of this refugee camp. That winter it had rained and snowed for weeks, making temperatures plummet to below freezing. Food and water were running out. He was terrified his baby girl was not going to survive. That's when I understood what he wanted. He was asking me to take the baby with me, out of the refugee camp, far away from the terror and death they had fled, and back home to America. He would rather give his child to me — a total stranger — than watch her die in his arms. That encounter unsettled me in a way I had never experienced. 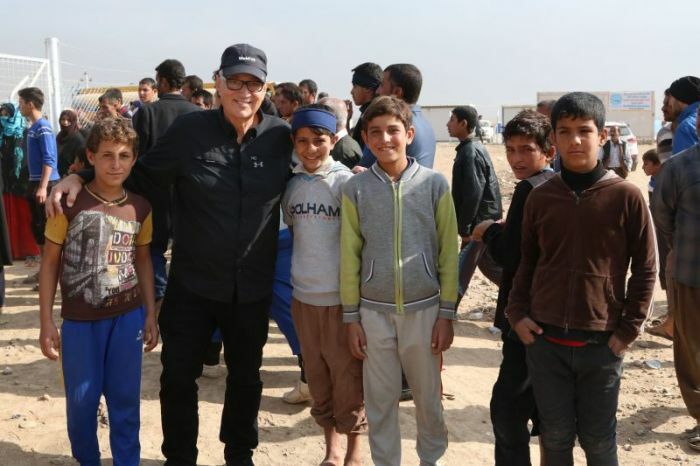 I was familiar with the condition of refugee camps in the Middle East, with the endless sea of makeshift tents, the scarcity of basic resources and the unsanitary state of facilities. I had heard countless, horrific stories of ISIS executing innocent civilians in the middle of the street and of the daring escapes of families in the dead of night. But I had never witnessed this depth of helplessness in a father's eyes. Words can't express how debilitating it is to see a father who's powerless to protect and provide for his child. That day, I learned a father's love could drive him to give his child away ... if it meant she had the chance to live. Raad was another father I met who was doing everything he could to keep his family safe. When ISIS arrived in the city of Qaraqosh, Raad, his wife, and four children — including a newborn and a disabled daughter — fled. Bombs were already falling around their neighborhood as they frantically piled into their family car. They drove north until they were stopped at a Kurdish roadblock and forced to abandon their car and proceed on foot. Raad had to carry his disabled daughter for miles, while his wife held their newborn son. Over the next few months, the family moved from one location to another, staying wherever they could find shelter — from an abandoned church, to a tent in the ground to an overcrowded apartment shared with other displaced families. None of these places offered the disability services Raad's daughter required. To make things worse, Raad couldn't work because he was a foreigner, so every day he worried about what his family would eat. "We are thankful to be alive and actually feel much safer in this area," he told me. "But our children still cry at night from flashbacks of ISIS' attack on our village." Listening to Raad's story — and to the stories of dozens of other refugee fathers in the Middle East — deepened my perspective on fatherhood. I wondered, if I were in their shoes, what would I do? What would I not be willing to sacrifice for my family? As both a father and grandfather of a beautiful family, this Father's Day I have so much for which to be thankful and proud. I've had the blessing of seeing my children grow into men and women, and even into mothers and fathers. I've also experienced the inexplicable joy of seeing the girl you once held in your arms holding her own newborn child. Being a father has been, by far, one of the greatest joys of my life. This Sunday, as my family and I gather to celebrate the fathers in our midst, I'll be thinking about Raad and the thousands of refugee fathers fighting to keep their families safe in the Middle East. And I pray that we might be moved to help them protect and provide for their families — because, if you ask them, that's all they want. At World Help, we're helping refugee fathers care for and comfort their families through these difficult days by providing emergency water, food, hygiene items, and medical aid. We invite you to join us and help these fathers who have sacrificed so much for their families.